"I like to meet new people. They've all got stories!" In many ways, ever-cheerful engineer Kaylee represents the heart of Serenity. She loves Mal's fate-smudged Firefly the way a girl might dote on a beloved pet, and is genuinely hurt when someone says something negative about it. Clearly, Kaylee thinks of Captain Reynolds as the ultimate big brother... tough-sounding, but a softie inside. Aces at her job and fun to work with, Kaylee soon develops a crush on mysterious passenger Simon Tam. Fortunately, fugitive doctor Tam also needs a little human comfort, and the two are gradually drawn together. Kaywinnet Lee Frye is Firefly's wrench wench, capable of keeping the ship flying long past the point when it should have fallen apart at the seams. She's not a tomboy, per se, since she enjoys extravagantly girly things like frilly dresses and pretty pretty parasols, but she's also confident enough in herself that she doesn't need to put on airs. She also doesn't embarrass easily: the first time Mal met her, she was in flagrante delicto with the ship's then-mechanic, but she was more concerned with diagnosing the engine's problems than covering up. The adorable Kaylee was played by the adorable Jewel Staite. The toy's likeness is a lot like Zoe's, in that it's okay from certain angles, but not as astonishingly accurate as the guys' faces. Maybe it's because she doesn't have a huge smile, like in the picture on the box? Kaylee is perpetually ebullient, but the toy looks slightly more reserved. Plus, her face is noticeably lighter than her chest and hands. 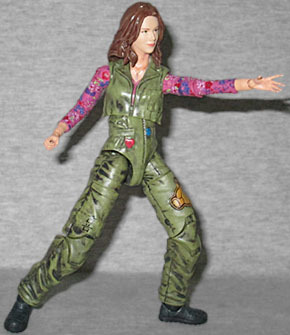 Kaylee, like the other Firefly Legacy Collection figures, is based on the show's promotional photos. The difference is this one actually appeared on the show, too. Maybe. She's wearing her "teddy bear" coveralls (so-named because of the big brown bear patch on the left thigh) over a pink, floral-print shirt. It's hard to tell if it's definitely the same one, but she wore a similar shirt in the episode "Out of Gas." 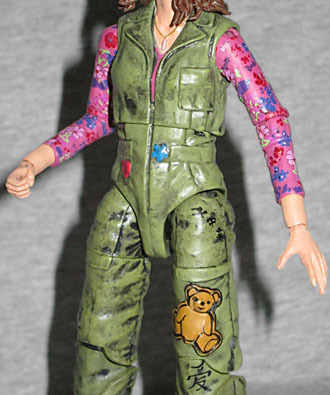 The jumpsuit is green, and in addition to the bear, has a red heart patch just below the belt, and a blue flower covering a bullet hole. There are also several Chinese characters printed on her suit: 喜 (happiness) above her right knee; 爱 (love) on her left knee; and 平 (calm), 出 (leave) and 幸 (good luck) on her left pocket. 出 is drawn upside down - accurate to the show, not a problem with the toy - but doesn't make any sense by itself. It and 平 may be intended as part of the stock phrase 出入平安 (peace wherever you go). Kaylee's shirt has ¾-length sleeves, which has the unfortunate effect of making her look like her arms are way too long. We've seen a custom that actually lopped off the bare section of the arm almost entirely, and it did improve the look. The "monkey arm" effect is exaggerated in photos, though; it's not nearly as weird in person. The problem is her arms are so thin, but get bulked out a bit by the wrist pegs. Better to have that problem than joints that break, right? Beyond the wrists, she's got the same joints as all Funko's stuff: head, shoulders, elbows, torso, hips, thighs, knees and ankles. The right ankle's swivel was stuck on my figure, but a little hot water got it moving with no problem. 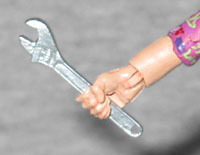 She comes with only a single accessory, but it's a perfect one for her: a wrench. To ensure she holds it properly, the opening in her right hand is squared off, rather than round. You know what else they could have given her, though? Her umbrella! Just buy a bunch of cocktail umbrellas and throw one in every package. Kaylee is the heart of Serenity - like Ice, she makes everybody around her be a better person. She's everyone's peppy little sister, and they all behave themselves when she's around. She's just as important to the ship's crew as she is to the ship's engine, and Funko has made a nice toy of her.